Jagruti Conveyor Belts Pvt. Ltd.
Power Roller Conveyor are specifically designed for pallets & other heavy material movement . In this type of conveyor system, all the rollers are interconnected with each other either through chain or belt for transmitting the power. In this conveyor all rollers are power rollers. These gives an advantage for the material to reach destination without any stoppage. The rollers are light weight and are designed for a long service life. These systems are controlled by smart microprocessor to give desired running of the conveyor line. The torque is evenly distributed among all the rollers nullifying the slip effect of rollers. © 2019 Jagruti Conveyor Belts Pvt. Ltd.
Information/data provided in this website is for general information only without any warranties of any kind and is subject to change without any prior notice. Use of this information is at the sole risk of the user/s. 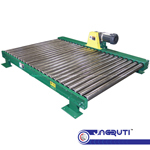 Jagruti Conveyor Belts Pvt Ltd, Manufacturer of Conveyor Belt Systems in Ahmedabad, Gujarat, India and its Directors/Employees assume no responsibility for the accuracy, completeness or reliability of said information/Data and shall not be liable for any damages arising from its use.